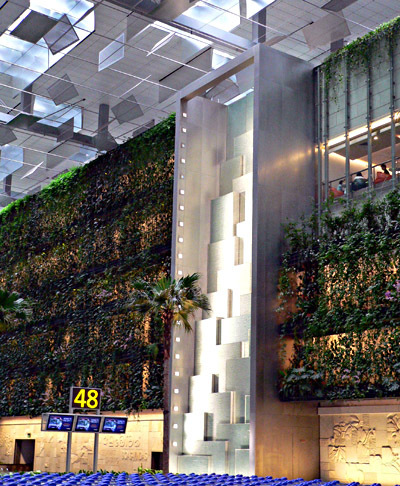 Vertical gardens have an immediate appeal. Normal (if that is the right word as they are still rare) green roofs are often difficult to fit due to constraints on the weight and usage of a roof. For instance, ducting and air conditioning is often positioned on a rooftop. Also the cost of a green roof is very high. If no one sees it up on top of a building, it can be a wasted expense - apart from the biodiversity and environmental considerations of course. But you could save a lot of hassle and give the money - typically £10,000 or more for a small roof - to a green charity. This is where vertical gardens come in. 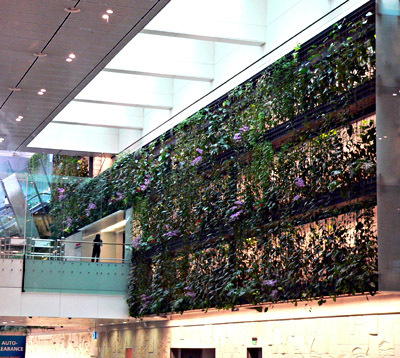 For a similar expense, a major statement can be made since the public can see and gasp in awe at your vertical garden. See our photos for more insight. They are fantastic to see in a crowded urban environment. 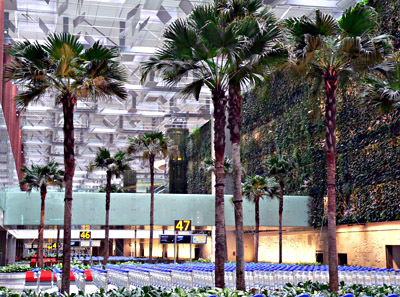 Most of these are in Singapore, and Changi Airport. Many more green roofs and green walls are going up all the tiume. There are also a lot of traditional walls that are full of plants even if quite small. So they are fashionable now. There are many examples, and even a new one here in London - always last with anything 'green' - at the Athenaeum Hotel, Green Park, near Picadilly in central London. This is about as touristy a spot as you could imagine. It is eight storeys high. It has different plants for the ascending heights, Asian nettles - Urticaccae - at the bottom and cliff dwelling plants at the top due to the wind. Many species are in the vertical garden, giving a bit of biodiversity, although I can imagine thehotel staff getting rid of any larger animals or birds. It was designed by a famous gardener - or reseacher, biologist, artist - the award winning Patrick Blanc. Patric Blanc has spent decades studying plants for vertical walls since he grew plants all over his bedroom as a kid. Slats and a special plastic / felt substrate attached to aluminium poles provide support with an automated watering and fertilisation system buolt in. So it is not very 'green' as the energy and technology expended to keep it all going is so high. But good for high energy urban spaces. The British climate is getting hotter and wetter in the summer and wetter in the winter, with many extremes such as drought, so it will be interesting to see how it fares - well probably, since it will be lovingly attended. 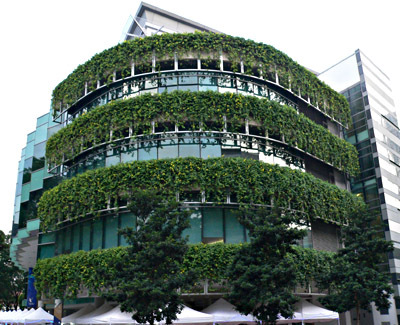 He has made 150 public (hotels and state buldings usually) vertical gardens since he started in 1994. He also does private garden installations. This will be added soon for anyone who wants to make their own. This is the navigation for DIY building advice, do it yourself, home improvement, garden design, garden rooms, self build, timber building, home tips, diy topics, gardens, gardening, green information, and much more. 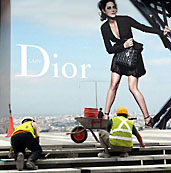 There is now a DIY building, construction, architecture and gardens image gallery. Please explore our site using the navigation below, or the Search in the top right corner.